Our large pairs of hour and minute hands are specifically made for use with our high torque movements. These motors have more power, so they will operate pairs of hour and minute hands up to nearly 18 inches in length. 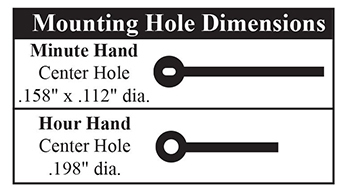 This length is based on the measurement of the minute hand only (the long one), from the center of the mounting hole to the tip, or end of the hand that points at the present time. The length of the hour hand is not considered when checking hour and minute hands. It is normally 2/3 of the length of the minute hand, depending on the style.